MSRP: $ 28.75 from PM on web hobby shop. $24.66 from a German on web hobby shop. Both stores sell it In the ARK brand box. 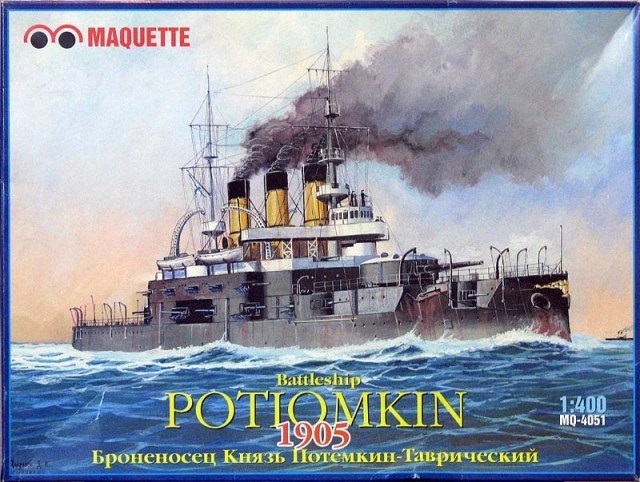 The Russian battleship Potemkin "Prince Potemkin of Tauris") was a pre-dreadnought battleship built for the Imperial Russian Navy's Black Sea Fleet. The ship was made famous by the rebellion of the crew against their oppressive officers in June 1905 (during the Russian Revolution of 1905). It later came to be viewed as an initial step towards the Russian Revolution of 1917, and was the basis of Sergei Eisenstein's silent film The Battleship Potemkin (1925). Following the mutiny in 1905, the ship's name was changed to Panteleimon. She accidentally sank a Russian submarine in 1909 and was badly damaged when she ran aground in 1911. Panteleimon participated in the Battle of Cape Sarych shortly after Russia declared war on the Ottoman Empire in late 1914 duringWorld War I. She covered several bombardments of the Bosphorus fortifications in early 1915, including one where she was attacked by the Turkish battlecruiserYavuz Sultan Selim; Panteleimon and the other Russian pre-dreadnoughts, managed to drive her off. The ship was relegated to secondary roles after the first dreadnought entered service in late 1915 and reduced to reserve in 1918 in Sevastopol. This kit comes in a very flimsy low quality cardboard box. It is tray and lid type and was sealed with tape and not shrink-wrapped. 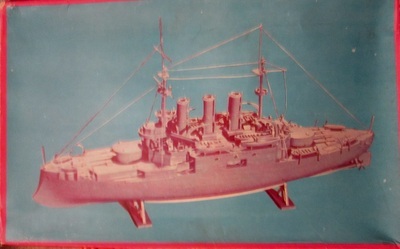 The box art shows the model made up and posed against an all blue background. It is unpainted. All the text on the box is in Russian only. Inside the box is 2 large light gray trees of parts in a sealed cello bag, a small loose decal sheet and the instructions. The decal has Communist naval flags on it with the hammer and cycle, used after the revolution. I bought a set of cloth flags that are of the pre-revolution type, that are white with a blue cross. The instructions are printed on low quality news print type paper. It is a single sheet that is folded in the center to create 4 pages in 8 ½” x 12” page format. All the text is in Russian only. Page 1 begins with profile drawing of the Potemkin, followed by what I guess is the history of it in Russian. Unfortunately, I cannot read it as I don’t know Russian…groan. At the bottom of the page is an exploded drawing showing how to assemble the propellers and their shafts. Page 2 and 3 have three more exploded drawings for assembly of the hull, base display cradle, decks and masts. Page 4 has another exploded drawing showing adding of the life boats. There is a lot of Russian text throughout the instructions only. There are not parts tree illustrations, but the parts have part numbers next to them. 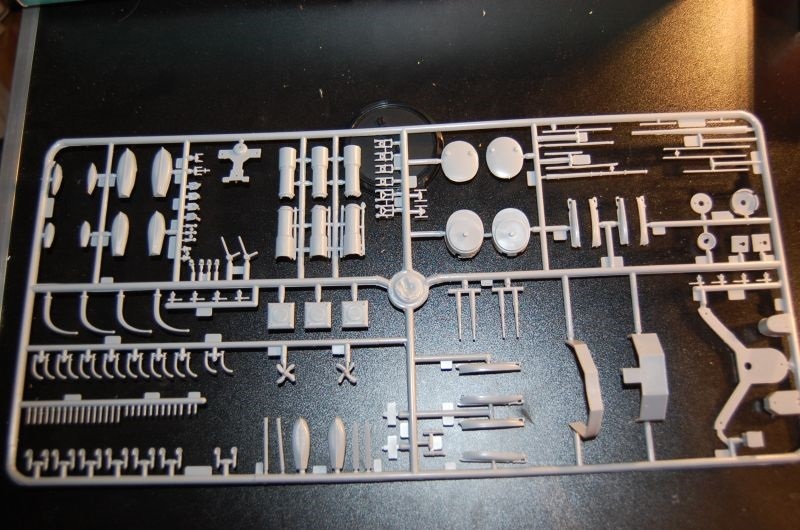 A search will be needed of the trees to find the parts needed for assembly. Bad move. If there are any colors to paint the ship mentioned in the instructions it’s all in Russian….sigh. I did however copy the box art of the Maquette reboxing of the kit. This shows the colors rather well. This kit is state of the art for 30+ years ago and could use a lot more detail. It is a scale that was popular back then too. I got my kit in trade with a guy in Krakow, Poland years ago. 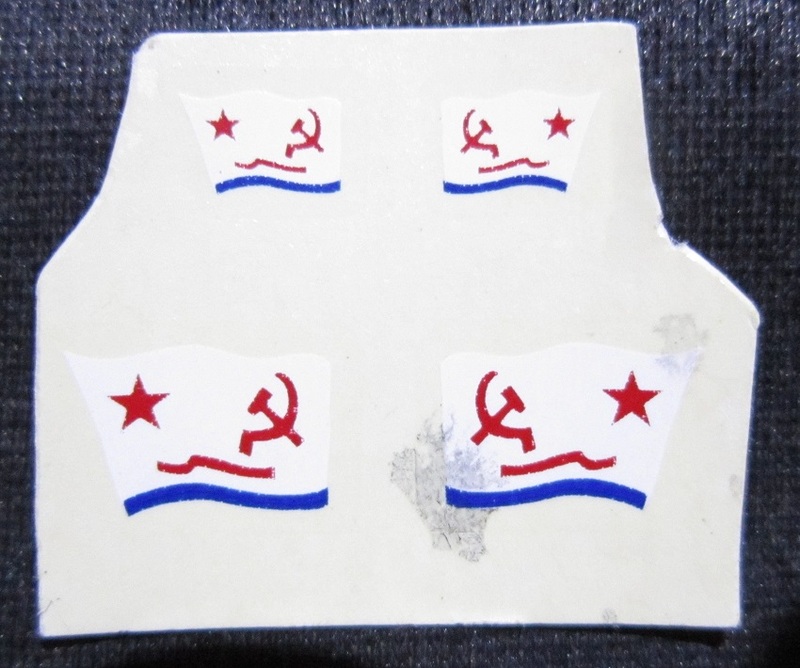 He also sent me a kit of a Soviet Ice-breaker ship that is the same quality and in a similar box. This kit started life as a Heller kit no. 40003 back in 1971. I am told that Heller made the mold for Ogonek in Russia, which was released by them about that same time. In the 1990’s, Maquette brand re-released the kit as their kit no. MQ-4051. Alender brand also sold it under their label in the 1990’s too, as kit no 040012. 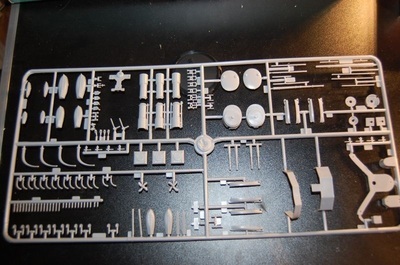 ARK in Russia now has the molds and has re-released the kit twice in 2012 and kit no. 40003 and 40009. The only thing that ever changed with the re-releases was the box art and the language inside, sometimes including English. I don’t know if any after-market PE sets etc. exist for this model.